Sterling Silver Hawaiian Plumeria (frangipani) leis Bracelet. Features linked frosted finish flowers, each with 14k gold plate highlights, sanded finish and central sparkling clear cubic zirconia. A beautiful piece of Hawaiian jewelry. Secured with a strong lobster clasp. 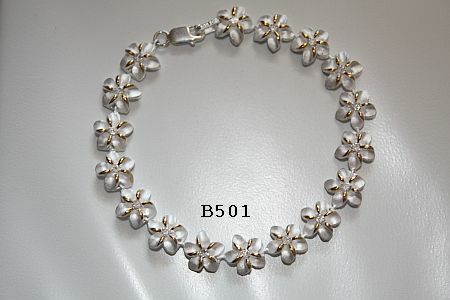 Measurements: 6mm diameter flowers, total bracelet length 7 inches (180mm). Also available in the following flower diameters: 8mm, 10mm, 12mm and 15mm.